Parsley, a leaf that is used chiefly as a garnishing herb, is often not credited for its unique health benefits. Many of us believe that parsley is used only as a decorative vegetable by restaurants around the world, completely ignoring the nutritional values that are an integral part of this green leaf. In fact, not only is the nutrition of parsley ignored but also the fact that this leaf has a unique delicious taste is overlooked. There are different varieties of parsley available in different parts of the world and the taste of each variety is different from one another. It is a biennial herbaceous plant, which means that the parsley plant grows naturally, dying after seed maturation and growing yet again once the plant is cultivated on a field. Parsley is not only popular as a food item amongst humans but also amongst insects, like butterflies and bees, who feed on the nectar of parsley flowers to obtain their food. Then, why wait for making an herb like parsley a part of your diet? Check out the glut of nutritious advantages that parsley offers to your heath in the following section. Buy some fresh green leaves of parsley and see the difference it brings to your health within a few days. Parsley has been grown worldwide for more than 2000 years now. However, its uses remained limited as a medicine before it became a popular garnishing food item. The first instance of using parsley as an edible herb can be traced back to the Mediterranean region of Southern Europe. Greece was the first country to make use of the parsley plant. Several years ago, parsley was considered a sacred plant in Europe, when the herb was used for decorating the tombs of the dead and for adorning winners in competitions. It was several years later that parsley became widely known for its medicinal properties and even much later that the green leaf became popular as a food item. It was during the Middle Ages that the Romans first started the practice of using parsley as a seasoning in food. There were two types of parsley leaves grown during that time – the curly leaf which was bitter in taste, and the Italian flat leaf which was known for its fragrance. The Europeans preferred the former to the latter. The Hamburg parsley which is grown for its roots is a recent parsley crop that has gradually gained popularity amongst the world masses in a span of two hundred years. Volatile oils present in parsley inhibit the growth of tumor in different parts of the human body. Because of the presence of volatile oils, parsley is often called the “chemoprotective food”, a type of food that helps to neutralize the ill effects of carcinogens in our bodies. 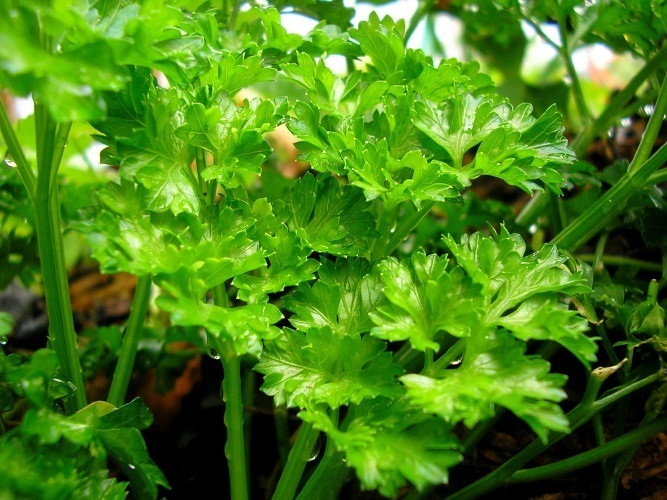 Flavonoids present in parsley make the green leaf a very good antioxidant. The antioxidant quality in parsley helps in the formation of oxygen radicals that prevent the damage caused by oxygen molecules to body cells. Parsley is a rich source of vitamin C which acts as a water soluble antioxidant in getting rid of harmful free radicals present in water soluble areas of the human body. It is the vitamin C content that goes a long way in preventing diseases, such as atherosclerosis, colon cancer, asthma, and diabetes. Folic acid present in parsley plays an important role in preventing several diseases, the primary amongst them being heart ailments. Medical reports suggest that consumption of parsley in adequate quantities may assist in preventing and curing heart diseases, like cardiac arrest and stroke. It is the folic acid content in parsley that helps in preventing colon cancer in men and cervix cancer in women. Parsley is rich in vitamin C that provides protection to the human body from inflammatory polyarthritis, better known as rheumatoid arthritis. Therefore, joint pains will be at bay if you consume parsley in proper quantities. Parsley has been a known remedy for the congestion and inflammation of kidneys and bladder, gravel, stones, and urine retention. This green herb is regarded as one of the best cures for edema, especially when all other remedies have failed to show any positive effects. It shows great wonders on expelling watery poisons, excess mucus, flatulence, and reducing swollen or enlarged glands. When consumed in the appropriate quantities, parsley is powerfully therapeutic for adrenal glands, optic nerves, brain, and sympathetic nervous system. Parsley added to your regular tea can help control blood pressure. Crushed parsley rubbed on bare skin helps in easing irritation caused by mosquito bites, rashes, and other types of itching. People suffering from bad breath can chew parsley leaves on a regular basis to get back their fresh breath. However, this is more a myth than a medicinal property of parsley. Parsley has about 36 calories per 100 gm of weight. Always purchase fresh parsley as opposed to the dried form of the herb. The parsley you buy should be deep green in color. The leaves must look fresh and be crisp on the touch. If you purchase a bunch of parsley, look properly for yellow or wilted leaves. These leaves must be removed because they are either over mature or rotten. If you have to buy dried parsley, always purchase organically grown leaves which ensure that the herb has not been irradiated. Place fresh parsley leaves in a plastic bag and store in the refrigerator. If the parsley leaves you have purchased have become wilted, sprinkle water on the leaves or wash them before storing in the refrigerator. Do not dry the leaves completely before storing. If you store parsley at room temperature, keep the leaves in an air-sealed container in a cool, dark and dry place. Make sure that the leaves are completely dry before placing inside the container.